TOKYO (AP) — North Korean leader Kim Jong Un complained of “U.S. hegemonism” to Russia’s visiting foreign minister on Thursday, as one of his top lieutenants was in New York trying to pave the way for a summit with President Donald Trump. Kim told Sergey Lavrov that he hopes to boost cooperation with Russia, which has remained largely on the sidelines in recent months as Kim has reached out diplomatically to the United States as well as to South Korea and China. Kim has previously made harsher comments and even threatened to launch nuclear attacks on the United States numerous times. But his comments Thursday come at a sensitive moment, when a senior North Korean official was in New York for talks with U.S. Secretary of State Mike Pompeo on the planned summit. After his meeting with North Korean senior envoy Kim Yong Chol, Pompeo said “real progress” has been made in the last three days toward setting the conditions needed for Trump and Kim Jong Un to have a successful summit in Singapore. 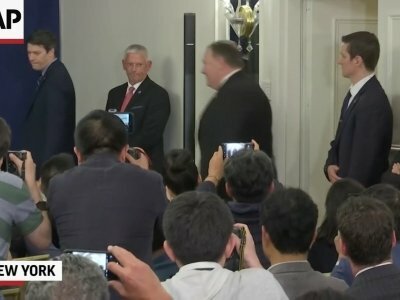 Still, Pompeo said he doesn’t yet know whether the meeting will proceed on the announced date of June 12 and that he believes North Korea’s leaders are contemplating a different path forward that would allow their nation to more fully integrate into the international community. Kim Yong Chol, the highest-level North Korean official to visit the United States in 18 years, plans to travel to Washington to convey a personal letter by Kim Jong Un to Trump. But continuing differences led Trump to abruptly cancel the planned summit last week, and then quickly announce it might still be held as scheduled. Despite having a border with North Korea and relatively cordial relations that President Vladimir Putin has seemed to want to develop further, Russia has kept a surprisingly low profile as Kim has emerged onto the world stage this year, meeting twice with Chinese President Xi Jinping and South Korean President Moon Jae-in. Lavrov’s visit suggests Russia wants to become involved and make sure North Korea informs it of its intentions and is mindful of Moscow’s concerns. In their talks, Lavrov relayed Putin’s “warmest regards and best wishes” for Kim’s “big endeavors” on the Korean Peninsula. He also expressed Moscow’s support for an agreement Kim reached with Moon at a summit last month that focused on measures to ease hostilities and increase exchanges between the two Koreas. He vowed Russia’s support for denuclearization and a broader effort to create a stable and long-lasting peace in the region, but indicated that Moscow believes sanctions can be eased while the process is in progress, which diverges from the U.S. position that denuclearization must come first.